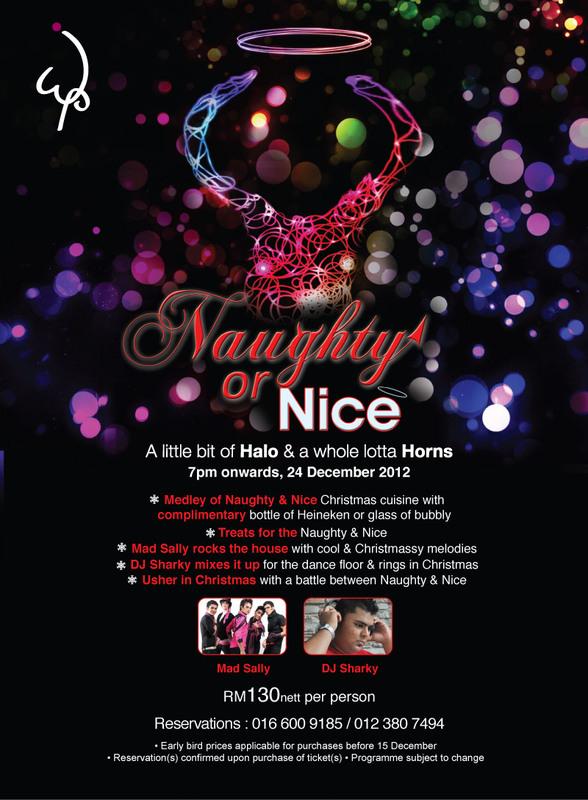 Whether you’ve been naughty or nice, you’re bound to have gobs of fun this Christmas Eve at WIP. Fringe performers in halos and horns will be dishing up treats for the good and tests for the bad…all in good fun. For that bit of dancing and prancing on the dance floor, Mad Sally will be on stage and later on DJ Sharky will be mixing up some groovy tunes. At the stroke of midnight a surprise countdown gambit will be a fitting finale to the event. Feast on sinful or healthy offerings at the buffet line like Smoked Egg with Caviar, Roast Turkey and Lamb, Prawn Bisque, Pan Fried Norwegian Salmon, Chargrilled Tenderloin and Scallops. Down your favourite potion from an extensive selection of champagne, wines, cocktails and spirits. Ticket price: RM130 nett per person – comes with a bottle of Heineken or glass of bubbly.